Behind the glitz and glory of LSU's iconic Golden Band from Tigerland are 325 students who dedicate their time, energy and talent to creating a one-of-a-kind experience for fans. Donors like Tom Sullivan (Journalism, '64), whose planned gift will provide care and maintenance for Tiger Band students' instruments, ensure they can afford to do that. "Tiger Band has a tradition of musical excellence unlike most schools that stems from the quality and dedication of the students in the group. This has been enhanced by the high-level musicians that the School of Music has attracted for years," Director of Bands Damon Talley said. "We rely on philanthropy to always continue that great tradition. Without it, it's very difficult to achieve the great things that this band can do." Team work, discipline, leadership, loyalty, attention to detail, comradeship and lasting friendships are the gifts Sullivan received from his time in Tiger Band. A New Orleans native, Sullivan started trumpet lessons when he was 10 years old. In high school, he switched to the baritone horn and was introduced to LSU through a summer program on campus. "I liked the northern Italian architecture, the pretty lakes, everything about the place," Sullivan remembered. 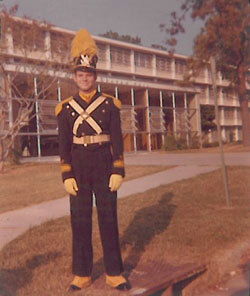 "I liked the band director, Mr. Tom Tyra, the youngest band director in the country at the time. I liked the fellow musicians, kids from other places in Louisiana. A lot of them were going to LSU. And I liked the idea that you got a little scholarship to play in the Tiger Band." As a Tiger Band member, he worked with Tyra and "Rocky" composer Bill Conti, Tyra's graduate assistant at the time. His "cherished" memories include a high school recruiting tour, recording the 1961 spring concert and traveling to three major bowl games. "My senior year we went to the Bluebonnet Bowl in Houston (we lost to Baylor)," Sullivan said. "It snowed in Houston, if you can believe that, and we played out in the open at the old Rice stadium. That was my last band performance." Today Tiger Band members rehearse more than 15 hours a week during the fall and perform more than six shows a year. Interestingly, most members, like Sullivan, are not music majors—making Tiger Band unique in its diversity of students' interests, strengths and career goals. Half of the students have jobs, in addition to their required full-time course loads. Over the next decade, the School of Music aims to offer endowed scholarships for every band position. "When students aren't able to work because of the time commitment of Tiger Band, they still have to pay their bills. Being able to reward members financially—to recruit those blue-chip players to be in the band, to be leaders, to retain them—is huge," Talley said. "It's an investment directly in kids, and not just kids from one area of the university. Tiger Band is about spirit and music making. But it's also about creating a well-rounded person who is ready to go out into the world and do really great things." You, too, can help ensure that current and future LSU students continue to put on their best performances. Consider leaving a planned gift to the LSU Foundation. Contact Julie Bolton Falgout, PhD, at 225-578-5846 or jfalgout@lsufoundation.org for more information. We can examine your particular situation and, together with your attorney and/or financial advisors, help you find ways to support LSU while ensuring your family's financial security.